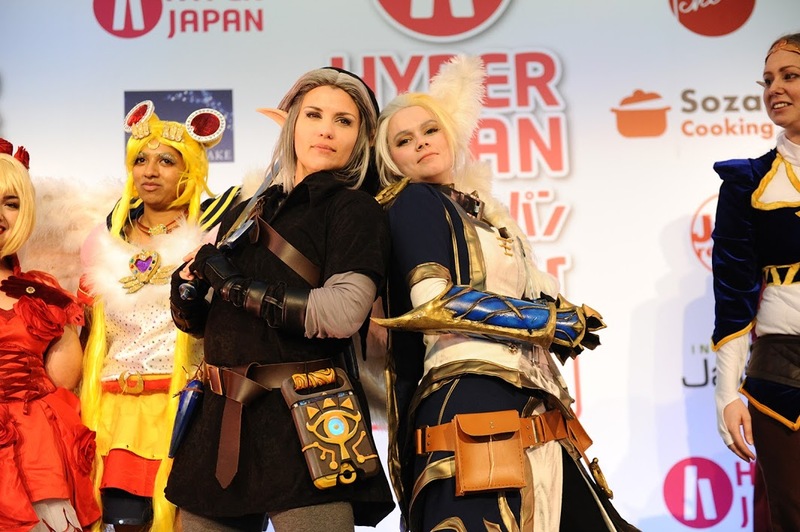 The COSTest is an opportunity for experienced cosplayers to show off their costuming skills onstage in front of the HYPER JAPAN audience on Sunday 14th July. a) The COSTest is open to all ages, but entrants aged under 18 must have their entry form signed by a parent or guardian. If you look young for your age, please bring proof of age. b) Costumes must be handmade (your own work) and proof of this must be submitted before the date of the COSTest, details will be provided to successful applicants. This can be done via photos, videos or a link to a URL documenting the process. Your costume does NOT need to be complete at the time of submission. c) The dimensions of your costume can be no more than 2 metres high and 1.5 metres wide (including any props). d) If you require any assistance getting both on and off stage, this must be noted in the sign up form. This is so we are aware in advance and the right help can be prepared for on-the-day. e) The use of pyrotechnics, projectiles, flames etc. are prohibited, as is any other effect that would leave mess or residue onstage (water, glitter, confetti etc.). f) Props must be created from softer materials such as foam or plastic. Wood is also allowed. Tougher and harder materials such as metal will not be allowed due to safety/hazard regulations. g) The use of motorised transport as part of a costume is forbidden on stage (legitimate medical devices such as electric wheelchairs are exempt). h) Any groups entering the contest are restricted to a maximum of five members. All entrants MUST provide at least two reference pictures of their character’s appearance. These can be attached to your online application entry or handed in with your registration form on the day. Please label them with the name of the character and contestant. This is so that the judges are able to fairly judge your costume’s accuracy, as they may or may not be familiar with the character. The COSTest will take the form of a performance and not a catwalk, with contestants walking on and off stage and posing, to show their costume to the audience. Detailed guidance will be provided in advance of the event. Music will be provided by the organiser. The following two fields pertain only to those who plan to enter COSTest as part of a group. Please add each member in a new box using the + button. The music will be cut to 1 minute to 1:30 because of time restraints. If you wish to have a time stamp, please refer in the comments. I understand that photographs taken of me during the HYPER JAPAN COSTest can be used by Cross Media for any reasonable use. Use of the photographs may also be sold, granted or transferred to third parties at the discretion of Cross Media. I have read and agree with the COSTest competition rules. I have attached a labelled reference picture of my character. I am aged 18 or over at the time of application. photographs taken of the child under my guardianship during the HYPER JAPAN COSTest can be used wholly or in part by Cross Media for any reasonable use. Use of the photographs may also be sold, granted or transferred to third parties at the discretion of Cross Media. 1. Participants agree to take part and be featured in marketing and publicity material for Cross Media, HYPER JAPAN and Eat Japan as required, as well as external media viewable by the general public, including but not limited to newspapers, magazines and websites. 2. Application forms and/or reference pictures cannot be returned under any circumstances. 4. All personal information collected via the application form will be protected by Cross Media and will not be provided to any third party outside of our staff and any services used for the organisation of the contest. 5. Cross Media accepts no liability for any loss, damage, costs, expenses or claims suffered or incurred by any person as a consequence of any use of or inability to use this application process, the HYPER JAPAN website, or any related media content. It is the sole responsibility of the applicant and/or parents/guardian to confirm with Cross Media regarding any queries or questions they may have about application, selection and/or participation. To read the Cross Media Limited's privacy notice, please click here.